Following up on his timely and well-received book, A Failure of Capitalism, Richard Posner steps back to take a longer view of the continuing crisis of democratic capitalism as the American and world economies crawl gradually back from the depths to which they had fallen in the autumn of 2008 and the winter of 2009. By means of a lucid narrative of the crisis and a series of analytical chapters pinpointing critical issues of economic collapse and gradual recovery, Posner helps non-technical readers understand business-cycle and financial economics, and financial and governmental institutions, practices, and transactions, while maintaining a neutrality impossible for persons professionally committed to one theory or another. He calls for fresh thinking about the business cycle that would build on the original ideas of Keynes. Central to these ideas is that of uncertainty as opposed to risk. Risk can be quantified and measured. Uncertainty cannot, and in this lies the inherent instability of a capitalist economy. As we emerge from the financial earthquake, a deficit aftershock rumbles. 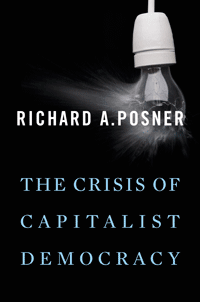 It is in reference to that potential aftershock, as well as to the government’s stumbling efforts at financial regulatory reform, that Posner raises the question of the adequacy of our democratic institutions to the economic challenges heightened by the greatest economic crisis since the Great Depression. The crisis and the government’s energetic response to it have enormously increased the national debt at the same time that structural defects in the American political system may make it impossible to pay down the debt by any means other than inflation or devaluation.